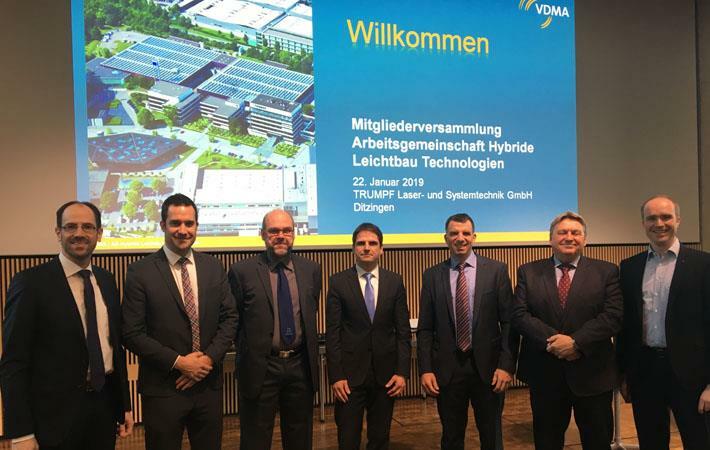 The members of the VDMA (German engineering federation) Working Group on Hybrid Lightweight Technologies have elected their new executive board for the period 2019-2021 at the recently held General Assembly at Trumpf Laser- und Systemtechnik GmbH. The committee discussed topics on conceptual and sustainable lightweight construction for tomorrow’s mobility. The committee appointed Marc Kirchhoff, who was earlier head of industry and key accounts automotive at Trumpf Laser, as its chairman. The new executive board will now comprise of Lothar Gräbener of Schuler Pressen GmbH, Dr. Ing Norbert Müller of Engel Austria GmbH, Manfred Reif of Dieffenbacher Gmbh Maschinen- und Anlagenbau, Jochen Schmidt of Karl Mayer Technische Textilien GmbH, Klaus-Peter Welsch of Geissag and Martin Würtele of KraussMaffei Technologies GmbH, according to a media statement by VDMA. At The General Assembly, new trends in traffic delivery in the cities was reported by Falko Fiedler M Sc, group leader of car body engineering at the Chair of Production Engineering of E-Mobility Components (PEM). This is the motivation for the development of the all-electric small van Streetscooter. Advanced mobility solutions for individual transport was discussed by Armin Müller, managing director of Emm! and inventor of the ILO 1 ultra-light vehicle. Dr. Matthias Graf, Dieffenbacher GmbH, presented the modular plant concept developed in the BMBF (The Federal Ministry of Education and Research) research project MoPaHyb using the example of an automobile seat shell. Lightweight construction has experienced certain hype due to applications with carbon fibre-reinforced plastics and now autonomous driving and digitisation are the focus of automotive engineering in addition to alternative drives. However, the committee agreed that it is important to develop a sustainable concept for the marketing of lightweight construction. The Working Group supports technology transfer, by accompanying the BMBF project ‘Modular production plant for heavy-duty hybrid components’, and by holding workshops on the development of lightweight demonstrator components. The Working Group is also represented on the advisory board of The Federal Ministry of Economics and Energy (BMWi ) Lightweight Construction Initiative. Furthermore, a cross-material lightweight construction strategy is to be developed and a long-term goal set.